The Double Diamond Adventure is a Limited Edition Hydro type weapon that can be upgraded from the Limited Edition Explosive Toboggan Ride. Nudging the carefully balanced bait on this toboggan begins an amazing skiing adventure filled with perilous fun! 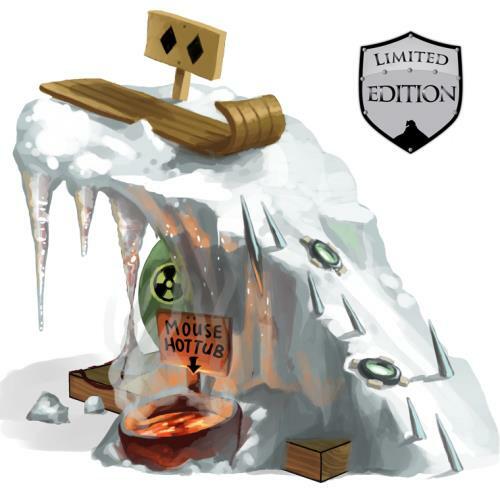 After traversing a slope filled with landmines and sharpened moguls mice can let their aches literally melt away in the magma hot tub. The Double Diamond Adventure is a Limited Edition weapon and can no longer be acquired by Hunters. It can only be crafted given the proper ingredients. The Double Diamond Adventure acquires a 20% Power Bonus when armed with Snowball Charms. Explosive Toboggan Ride - Source of Toboggan Ride Parts required for crafting the Double Diamind Adventure. 23 December 2010: The Double Diamond Adventure was introduced as part of the Great Winter Hunt 2010. The sign with two black diamonds beside the ski sled is a reference to the difficulty ratings in Alpine skiing, where the double black diamond symbol indicates the most difficult ski trails intended only for the most experienced skiers. 13 December 2016: The Double Diamond Adventure gained a 20% power bonus when armed with Snowball Charms.